This past weekend at our annual Spring Dinner in Rochester, the Pride Agenda shared a special video message from Attorney General Andrew Cuomo with everyone in attendance. His message was played just hours after he announced his candidacy for Governor earlier that day. In this video, Cuomo talked about his work as Attorney General on issues important to LGBT New Yorkers and expressed his strong support for marriage equality, transgender civil rights and safe schools for LGBT youth. At the Spring Dinner we also announced that Ross Levi has been named the Pride Agenda Executive Director. Ross has been with the Pride Agenda for more than 10 years and has been a part of every statewide legislative victory ever achieved by the organization. Click here to learn more about the announcement and Ross’s extensive background working on our issues and in the LGBT community. We'll have more updates from the Spring Dinner soon, including photos, video of Ross's remarks and video of State Senator Eric Adams' passionate keynote speech. If you'll be in NYC this weekend, show your support for LGBT rights and full equality at the Harvey Milk Day of Action march on Saturday, May 22. 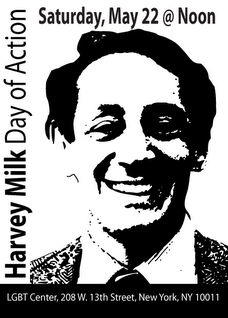 On May 22, cities all across America will pay respects to Harvey Milk on his birthday. Remembering his numerous achievements in a push for LGBT equality, thousands of activists, allies and community members are organizing local actions to demand full federal equality. The march in NYC begins at noon at the LGBT Center in Manhattan (208 W. 13th btw 7th and 8th Aves) with rallies along the way, including Washington Square Park, St. Vincent's Hospital, the Marriage Bureau, and finally ending at City Hall. More information here and here. We hope to see you there! From left to right, North Country Constituents: Andrea Adams, Patty Bentley, Jenna Manders, Heidi Anne Tatro, and Fiona Fogarty. Senator Betty Little is in the middle. The Pride Agenda held GENDA Advocacy Day in Albany on May 11, 2010. Participants from key senate districts across New York State represented Western New York, Long Island, the Capital District and the North Country. Everyone traveled to the Capital (some starting out very early in the morning) for the opportunity to meet with their senators and urge them to support the Gender Expression Non-Discrimination Act (GENDA). Additionally, our GENDA campaign partner organization, Housing Works, brought a van of close to 20 advocates from NYC. While over 60 advocates attended crucial legislative meetings, there was also an important opportunity for activists to mix, mingle, and share strategies and best practices around our efforts to bring this bill to the floor of the New York State Senate. These committed transgender rights advocates represented a wide spectrum of communities, including long-time transgender activists, family members, faith leaders, union members and newly active constituents—lesbian, gay, bisexual, transgender and ally. The Pride Agenda would like to sincerely thank all of the activists and individuals who took time out of their lives, took time off from work, and travelled long hours and many miles to do the important work of meeting with their legislators in Albany. The information that came out of the legislative meetings was positive and helpful and adds to the momentum to bring the bill to the floor before the end of session in June 2010. GENDA Advocacy Day served as an important step in the campaign to win civil rights for New York’s transgender citizens. Of course, there’s still much work to be done to pass GENDA into law. To get involved in these next steps, please contact Transgender Rights Program Organizer Ejay Carter at (518) 472-3330 ext 306 or ecarter@prideagenda.org or sign up to receive our action alerts to stay informed on the Pride Agenda’s work and our upcoming opportunities to get involved! Rochester's Empty Closet profiles Pride Agenda Interim Executive Director Joe Tarver. A ruling by the New York Court of appeals found that the lesbian non-biological mother of a child who she had raised with her former partner has the right to seek custody of the child because the couple has a Vermont civil union. The court's decision doesn't clarify exactly what this means for out-of-state marriages or for non-bio parents without legally recognized relationships. Jurors in the trial of two men who attacked a Brooklyn man in 2008 are attempting to figure out what factors set off the violence. The defendants reportedly yelled anti-gay and anti-Hispanic slurs during the attack, and their motives will determine whether they are convicted of a hate crime. A married gay couple from Rye, NY writes eloquently in the Journal News about the unfairness of their relationship being treated differently in the eyes of the law. Argentina may be the next country to legalize gay marriage. The Argentine House of Deputies on Wednesday approved marriage equality legislation and sent it to the Senate for consideration. The country's president has promised not to veto the measure if it reaches her desk.